There may be no truth in the rumour that the late Seán Ó Riada was reported to have remarked of céilí bands that he’d shoot the rest but keep the Tulla! As it happens, there would be no need because most of the rest have disappeared anyway but the Tulla Band lives on. Doubtless, as soon as this appears in print, claimants will come forth to announce that this or that band have been playing since before the flood, but I do not think that any band can truly claim to have made a longer and more significant contribution to Irish traditional music than the Tulla Céilí Band. Céilí bands tend to be somewhat loose groupings and are often casually thrown together for a particular occasion, perhaps to provide music for a local céilí or to compete in a fleadh; such was the humble beginnings of the Tulla. Certainly, it is hard to imagine that when a Limerick schoolteacher, Mrs Cunningham, was organising the Féili Luiminigh in 1946 and casually remarked to her sister, Teresa Tubridy, that it would be nice to see a band competing from East Clare, that the same band would still be going strong forty two years later! Regular readers of this publication [Dal gCais] will have read of the Ballinahinch Céilí Band formed around Martin Rochford’s homeplace in 1944 or ’45, and although the formal relationships between this ensemble, and that called together by Teresa Tubridy in 1946, has been obscured by the passage of time, a number of the participants were shared. Flute players Paddy and Jim Donaghue and the fiddle player Paddy Canny, from the original band, were joined by fiddle players P. Joe Hayes, Bert McNulty, a Garda based in Tulla, and Aggie Whyte a member of the musical family of Ballinakill Band fame. With Teresa Tubridy to provide accompaniment on the piano the band seemed complete, until on the night of the first rehearsal someone remarked that it would be nice to have an accordion, and somebody else remembered a good young box player from just over the Galway border, and so they sent for Joe Cooley of Peterswell. On the day of the Féile no-one could compete with the Tulla, and as Seán Reid (present with another bunch of musicians) said: “Sure the Clare musicians – every thing in the way of traditional music they mopped it up!” Interestingly, P. Joe Hayes remembers another band present on that day: The Corcomroe Céilí Band which mainly consisted of members of the talented Byrt family from Ennisytmon– a precursor of the later ‘battles’ between North and East Clare at the Fleadhanna Ceoil. As a man with a growing family Seán was placed in a most difficult position, and so decided to continue to organise the transport for the Band but leave off playing for a while. However, someone reported his presence at an engagement in Galway and he was duly demoted. At that point Seán decided he might as well take his chance with the Band and so the playing relationship was resumed. If this story seems far fetched now it should be remembered that is was not too long ago that traditional musicians did not enjoy the respect accorded them today. The late 1940s probably mark the low point in general interest in traditional music in Ireland, and outside a few isolated rural areas the music and musicians were often held in general disdain. For example, the output of traditional music on Radio Éireann was negligible; Seán Reid calculated it to be less than nine hours per year! It was therefore quite a feat for the Tulla Band to gain a broadcast in 1948. The story of that occasion has been told before in Dal gCais, and whatever the shortcomings of the musicians any problems with their output almost certainly owed more to the unfamiliarity of the radio producers with the requirements of the traditional musicians than any inherent failings in the Band, a point well illustrated in the revealing article by Proinsias Ó Conluain in Dal gCais (No. 8, p. 57f). We are fortunate to have an example of the Band playing in that era on a private recording. P. Joe Hayes recalls that the studio was owned by Bill Stapleton and that solo tracks were also cut by Joe Cooley, Paddy Canny and himself. My copy of the Band recording is in very poor condition but appears to feature 3 reels: The Ashplant/Cooleys/Ships are Sailing. Certainly, Joe Cooley’s accordion can be heard along with the flutes but the fiddles are lost in the general background noise. The general impression is rather like the later ‘78’ recordings: a steady tempo, probably considerably slower than most of today’s music, and, at this point in their career, no drums. 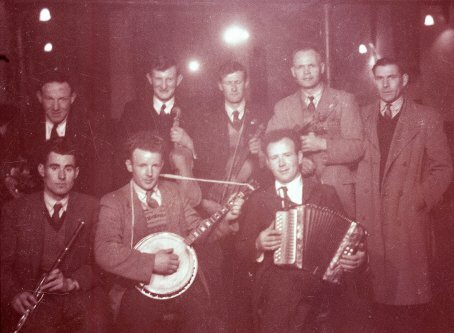 The Tulla Céilí Band c.1955. (L-R) Back Row: Paddy Canny; P.J. Hayes; unknown man; Sean Reid; Martin Byrnes. Front Row: Michael Preston; Seamus Cooley; Joe Cooley. Photo: Michael John Glynne. In 1948 Joe Cooley left for England. His replacement in the Band was another giant of the accordion, Paddy O’Brien of Tipperary, whose playing, particularly as circulated on some 78 records made in the fifties, was to influence a whole generation. In 1951 Joe returned to the Band and for a while the Tulla had both Paddy O’Brien and Joe Cooley – a fascinating combination with their differing styles. This was, however, a passing phase as both shortly left for the USA and were replaced by Paddy and Joe McNamara from Cruisín who were to serve the Band through some of its fines moments. The early fifties saw a re-birth of interest in Irish music. The late Seán Reid was one of the chief proponents of Comhaltas Ceóltoirí Éireann (though he was not delighted at some of its later commercial and nationalistic excesses) and the early Fleadhanna must have been tremendously exciting and emotional for musicians who had been neglected for too many years. The Tulla Céilí Band competed at the first Fleadh Cheoil in 1953 in Athone, without success, the céilí band competition being won by the Aughrim Slopes Céilí Band. However, band member Paddy Canny did become the first winner of the Coleman Cup. It could be argued that the popularity of the Fleadhanna Ceoil marked a turning point in the development of the céilí band. Many Irish céilí bands recorded in the thirties such as the Ballinakill, Aughrim Slopes, Moate, Kincora, and no doubt many of those not recorded, consisted of smallish groupings of musicians tied by close family or social relationships. They did not use any percussion but relied on simple piano accompaniment, probably influenced by the earlier American-made records. It is really quite difficult, on the evidence of our ears, to think of those early recordings as céilí bands in the way that one would think, for example, of The Tulla, The Kilfenora, or later bands like The Castle or Pride of Erin, as the format for these appears to owe more to the formalised bands of the thirties like The Austin Stack Céilí Band, or the Dublin Metropolitan Garda Céilí Band, or, most likely, London-born piano player Frank Lee’s Céilí Band, whose recording career began as early as 1933, by which time he had already included drums in his line-up. These were the bands whose musical venues were the commercial ballrooms of the large cities in Ireland and the United Kingdom, playing for crowds who were accustomed to the sound of the commercial dance band with their rhythm sections of piano, bass and drums. 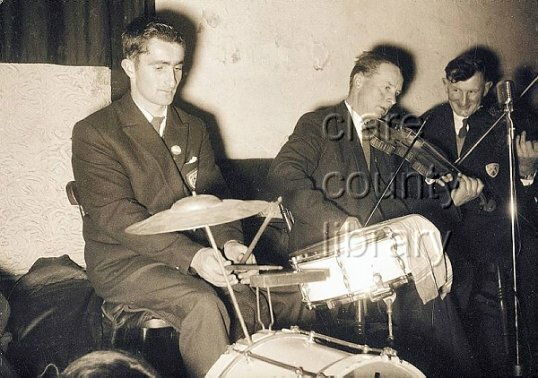 Even bands such as The Tulla, with their foundation in the Irish rural areas, often had to play in large ballrooms, and, certainly, by the time of the first Fleadh Cheoil, percussion was becoming the norm. The popularity of the Fleadhanna, and in particular the céilí band, prompted the formation of many bands, one of whilch, The Kilfenora, founded in 1953, won first prize in 1954, 1955 and 1956 – a year in which the Tulla finished runners-up. It is interesting to ask whey these newcomers should have been more successful than an established outfit like the Tulla, and I think a number of reasons can be suggested. In reality, the Kilfenora was not a ‘new’ band. As readers of the Jimmy Ward article will know, most of its members had been playing together for many years and their shared background gave them a uniformity of style and material. The Tulla, on the other hand, came from widely assorted backgrounds and their widespread individual locations made rehearsal difficult and infrequent. However, the great talent contained in the Band meant that over a full night’s playing great variety and entertainment could be provided for both the dancer and the listener. The Kilfenora was formed from the solid stock of North Clare dance musicians, specifically to meet the criteria of the prevailing mood, whereas the Tulla, after a similar start, had to re-adapt its playing to suit the rigours of competition. In 1957 the tide of Kilfenora success was stemmed (if only momentarily) and the Tulla captured their first All-Ireland title at Dungarvan. The cosmopolitan nature of the Band is revealed in the winning line-up: Flutes: Michael Preston (Sligo) and Seamus Cooley (Galway); a mainly East Clare fiddle section of P. Joe Hayes, Paddy Canny, Dr Bill Loughnane and Jack Shaughnessy (from Tubber, just across the Galway border); Paddy and Joe McNamara (Cruisín) on accordions; Jack Keane (Clarecastle) on the drums, and Seán Reid – honorary Clare man – on piano. A year before the All-Ireland victory, the Band passed another, and, perhaps – for later generations – more significant milestone: the production of their first gramophone records. These were made for the HMV company in their Dominic Street Studios in Dublin. P. Joe recalls that recording opportunities in those days were scarce and the members of the Band were fairly nervous of the audition. That hurdle was safely negotiated and the records made preserve for us the sound of an early Tulla Céilí Band. The line-up for the recording was similar to that which won the All-Ireland, with the exception of Peter O’Louglin replacing Seamus Cooley and the fiddle section missing Dr Bill Loughnane. In 1958 the Band made its first trip to the United States. One or two of the regulars were unable to make the trip and the line-up consisted of Seamus Cooley and Michael Preston on flutes; Jack Shaughnessy, Dr Bill Loughnane and P Joe Hayes on fiddles, drummer Jack Keane; pianist Seán Reid; and Martin Mulhare from Gort on the accordion. It was, in P. Joe’s words, ‘a memorable trip’ starting with a massive send-off from a huge crowd at Shannon and, in the days before jumbo jets, a 14 hour flight. The Band played to rapturous audiences in America, mainly in dance-halls around New York. “It’s important when you’re putting tunes together that you always get a rise to the next tune, and you wouldn’t be playing too many tunes in one key, better if you change from one key to another. We had one terrible advantage, we had an awful lot of music, each musician would bring their own tunes. When Paddy O’Brien joined us he had a rake of tunes, and we learned a lot of them from there”. The Band has always done a lot of touring, and as well as the trip to the USA the same year saw them in Britain, a visit which was repeated each year until 1963. 1961 saw a further trip to the USA following a second victory in the 1960 All-Ireland Fleadh Cheoil, in which the Band showed only one change from the victorious outfit of 1957, with Peter O’Loughlin replacing Seamus Cooley on flute. The early sixties however were to see an end to the Kilfenora and Tulla fighting for honours in the fleadh cheoil, 1962 being the last year that the Tulla entered competition. After the Club Céilí series the Band continued its usual pattern of céilí work, and then in 1970, after a 12 year gap, their second LP record was cut. The circumstances surrounding the making of this record, and its two successors, were unusual to say the least. The Band had changed a little since the Club Céilí broadcasts leaving J.C. Talty as the sole flute; P. Joe had been joined in the fiddle section by Michael Murphy from Ennistymon, a man with the distinction of having played for both the Tulla and the Kilfenora; however Mattie Ryan, George Byrt and Martin Garrihy remained on accordion, piano and drums. “It was actually a small band…… someone would come up to me and say “You had a great band in the early years”, when we had a great big sound but it could be very drab on occasions too, and I probably think that the best was in the early seventies, around the time of the records; even though they were smaller bands, they had more compact arrangements”. Certainly there is a lift to the Band’s playing which is more pronounced than on the ‘78’ recordings, and the individual instruments can be discerned which does not detract from the quality of the ensemble playing. It is, however, a hazardous job to comment on the Band’s playing in a particular era on the evidence of gramophone recordings which are as much influenced by the abilities and attitudes of recording managers and engineers as by the participating musicians. There is, for instance, a strong suspicion that the speed of recordings on the album Sweetheart in the Spring (the third of the ‘70’s offerings) has been increased in order perhaps to provide an impression of extra vitality or maybe just at the whim of some executive. Curiously, the musicians would appear to be playing approximately half a tone above concert pitch (maybe not unusual for flutes and fiddles but odd for piano and accordions) and those with variable speed turntables may be excused for playing at a little less than 331/3 revolutions per minute, or if you want to be more precise, to slow down the turntable until the Band are playing in concert pitch. (L-R) Martin Vaughan, Francie Donnellan and PJ Hayes playing at a St Patrick’s Day dance in Ennistymon, 1963. Photo: Michael John Glynne. “We play fairly fast in the Band but some of the music I hear is ridiculous! I think modern dancing has contributed an awful lot to that now. It’s really great to see the youngsters dancing but I have said umpteen times that something should be done about speed. Joe Cooley was a man that played very slow but people danced to that music. Actually what’s happening now is that the musicians play to the dancers and they are dancing so fast that when you get to a certain point there’s no time in it at all. Actually these dancers can dance without music, they just have this rhythm now and if you don’t play that for them they don’t know how to dance it. I don’t know why they dance so fast, it certainly hasn’t helped dancing anyway. However, if you have the old set dancers doing a Caledonian Set and if you play with a good lively rhythm, you’ll find you get great dancers and you don’t have to go mad playing. I like good lively music but there’s a point when you’ve gone over the top and there’s no enjoyment”. The activities and development of Céilí bands has provoked a wide range of differing reactions; in the early days of the ‘20s and ‘30s, during their initial phase in Great Britain and the USA, they were welcomed by exiles because they provided a reminder of the music of their homeland, and by the nature of their volume of sound allowed the performance of Irish music and dancing in the huge commercial halls, which were often the only platform available for these activities. Similarly, with the breakdown of the country-house dance and the all-conquering advance of the hall through the Irish countryside, the Irish based bands of the ‘30s and ‘40s were able to provide a rare outlet for the music and dancing. In the late ‘40s and early ‘50s the performers and supporters of Irish traditional music were becoming an endangered species, and, in the manner of all such threatened, banded together in a tightly knit community to protect themselves. Out of such actions sprang organisations like Comhaltas Ceoltóirí Éireann, and events such as the Fleadh Cheoil. “In the hopeful years of the early Fleadhanna, through those glorious gatherings in Loughrea, Longford, Boyle, etc., and right down to the present day, the senior Céilí Band competition has been one of the highlights of Fleadh Ceol na hEireann. The intense but friendly rivalry, the fame of the great bands and of their individual members, the carnival atmosphere, the tension as the decision is awaited, all combine to make for a memorable occasion”. “Fiddles and flutes I maintain are the backbone of the céilí band but you do need the accordion now – some kind of instrument you can hear, and the accordion is great for that. Not that I approve of too much accordion by any means but it puts a bit of body into it. We played for nearly ten years without a drummer including playing in big ballrooms and we seemed to get away with it but if your céilí band is playing for dancing you want rhythm and the drum keeps the time. I wouldn’t agree at all with Seán Ó Riada criticising drums in a céilí band”. “The banjo player puts a certain amount of body into the Band. Nowadays we have lighter toned accordion players like Michael McKee and Andrew McNamara, and the banjo puts a bit of body into it as long as you don’t let too much of it be heard. The Kilfenora always had a banjo with Jimmy Ward and a lot of people say it isn’t the most traditional instrument but the way I feel about it is, I think there are only a few céilí bands at the present – mainly the music is played by groups – and after all the years we don’t like to break up the Band. If I can keep it together, which is difficult enough, with the banjo in it, it isn’t too bad”. “It is not a new train of thought, we often had this discussion. Paddy Canny tended towards the view that it would spoil you and I think in a way that it would, but that was my style of playing before I joined the Band. I was playing for sets and my beat of time suits dancing. I don’t think it hurts Martin. When he comes home and plays he’s completely different. He plays very slowly compared to how he plays in the Band”. We are able to judge this matter for ourselves as both Martin and P Joe Hayes can be heard playing on records outside the context of the Band. The most commonly heard criticism of young musicians it that they play too fast, but the most likely cause for this is lack of opportunity to play for dancing. It is very easy when playing in sessions to let the music run away with you and frantic displays of flat-out virtuosity are often lauded by non-expert listeners, especially when they don’t have to dance to it. Now the pendulum seems to be swinging back and the fierce criticism of céilí bands seems to have been assuaged. After all, even those céilí bands who have adopted some of the more outlandish features of popular music sound deeply rooted in the tradition compared with the outpourings of modern ‘folk-groups’. Doubtless the arguments will continue to rage and I for one will be happy that they do, for as long as people continue to discuss music and as long as musicians play and dancers dance, then we can be sure that the tradition will live on, and that the Tulla Band will continue in the vanguard of that tradition. After a long break the Tulla were back on their travels with visits to England in 1978, 1979 and 1986 where they played before massive audiences. The U.S. tours were revived in 1982 to be repeated in 1984 and in 1986 From their first visit back in 1958 the Band have always enjoyed a wonderful reception in the U.S.A. and in 1986 the tour was no exception with the Band feted wherever they went. Perhaps the highest honour was paid to them in Chicago where the Band was given a tour of the City led by the Commissioner, John Halpin, which included a visit to the Mayor’s Office where P. Joe Hayes, as leader, was presented with the key to the City by Mayor Harold Washington. 1986 also saw a return to the recording studio for the Tulla Band. This time the venue was the G.T.D. studio in Galway to record a 40th anniversary cassette which, for those who haven’t yet acquired a copy, is an absolute must. There are some 20 tracks featured (great value when you consider the meagre offerings on some cassettes and albums) and include the complete Band on 12 selections, 4 vocals from Michael Whyte with band accompaniment and 4 items demonstrating individual Band members: 3 reels from P. Joe Hayes, 2 reels on solo flute from J.J. Conway, a couple of reels from Michael Murphy, and finally a flute and fiddle duet where J.C. Talty and Michael Murphy play the Ennistymon Farewell and the Concert Reel. The full line-up of the Band is: Fiddles: P. Joe Hayes and Michael Murphy; Accordions: Seán Conway and Michael McKee; Piano: George Byrt; Concert flutes: J.C. Talty and J.J. Conway; Drums: Michael Flanagan; Vocals: Michael Whyte. This is undoubtedly in the tradition of Tulla Band recordings and demonstrated the Band in great heart and, for the first time, allows the listener to hear the individual musicians. There is no single reason why the Tulla Céilí Band has lasted while many others have faded into obscurity: the good fortune to have a man of such enthusiasm, integrity and devotion to Irish music as Seán Reid to lead the Band through the difficult years; the location of the Band in a county which has largely held on to its traditions while others have abandoned theirs; the ability to call on a stock of traditional musicians of unrivalled ability; to these can be added another, perhaps, in the end, more tangible reason; the determination of one man to maintain a worthy tradition where others have often wilted: P. Joe Hayes. I know P. Joe, in his modesty, would not thank me for such tributes; however, forty years unbroken membership and thirty years as a leader of the Band have given him an unrivalled knowledge of the workings of céilí banks, and a profound insight into the development of Irish traditional dance music over the last half century. Forty years and more have passed since that chance chain of events which let to the formation of the Band. Forty years which have seen musicians come and go (and even expert critics come and go) but the continued popularity of the Tulla Céilí Band is a living testament to the musicians who have soldiered on through bad times and good, not for the thought of personal gain but for their love of the music. In a short article one cannot hope to cover every aspect of the Band’s achievements and apologies are made to those musicians who have contributed to the Band and not received their due tribute. However, their greatest testimony can be seen in the Band striding forward to another 40 years of all that’s best in Irish traditional dance music.